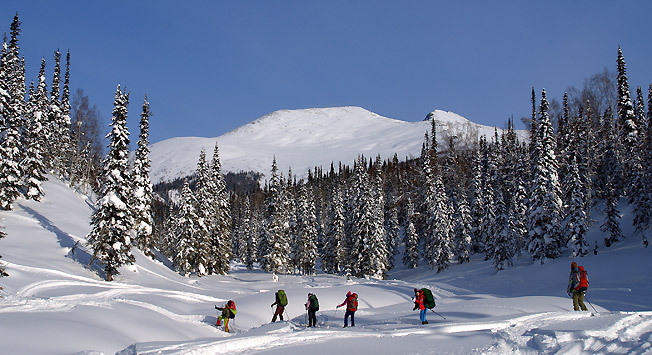 The expedition “Skiing in the Siberian Taiga” begins in Novosibirsk, which can be reached by train or by plane from Moscow or St. Petersburg, in addition to many other large Russian cities. Novosibirsk is a major hub and there are daily flights. From Novosibirsk, along with staff from Sibirskie ekspeditsii, the group will go to the village of Amaz (Luzhba station) in Kemerovo Region. The tour costs 30,000 rubles (about $485) with equipment, medical insurance, accommodation, meals and guides all included in the price. You are expected to get to Novosibirsk on your own. Sibirskie ekspeditsii emphasizes safety. The group registers with the local Ministry of Emergency Situations before each trip and is equipped with an Iridium satellite connection, which works even in the thickest Siberian taiga.